While You Were Sleeping introduces us to Tara Logan. Wife to Noah, Mum to 17 year old Rosie and 11 year old Spencer. Rosie is somewhat troubled and is a constant worry for her parents. Spencer is the complete opposite and Tara often finds herself feeling guilty for not paying him enough attention because of Rosie’s behaviour. I’m sure lots of parents would relate to this. I am a parent of two teenagers who are as different as chalk and cheese! One afternoon Tara pops across the street following a message from her neighbour. She stays for a glass of wine, but the next thing she knows it’s morning and she’s waking up in bed with Lee, with no memory of how she ended up there or if anything happened between them. When she realises Lee is dead, having been stabbed to death, she panics and leaves the scene of the crime. I can’t judge. Who knows how any of us would react! I’m pretty sure I would have called the police, but that’s easy to say. Tara knows she didn’t kill Lee, of that much she is sure. Who would want him dead, but leave her alive? A murder investigation begins and before long Rosie becomes a prime suspect. Tara is convinced she wouldn’t be capable of such an horrendous crime though, she just needs to prove it. As the investigation progresses I pretty much suspected everyone! The twists and turns kept me turning those pages. I thought I had it sussed on several occasions, but I changed my mind after almost every chapter! I was totally wrong the whole time! Needless to say the situation puts a lot of strain on Tara’s and Noah’s relationship and he moves out. Before long Tara finds herself drawn to the detective investigating their case. This is the only part I struggled with, if I’m honest. I get why Tara would be drawn to Holden, as she’s feeling vulnerable and he makes her feel safe. I can understand he might be attracted to her, but their kiss seems to happen quickly, whereas I would think a detective would wrestle with his professional ethics for a bit longer at least, before acting on his attraction to someone whose case he is investigating. Having said that I don’t know any detectives. Maybe this happens all the time!? This didn’t spoil the story for me in any way, I just didn’t find this part entirely believable. Overall, While You Were Sleeping is an intriguing story which draws you in and doesn’t let you go until you find out the truth. The utterly shocking truth!! I couldn’t quite believe what I was reading! Brilliantly written, as expected. If you’ve never read a book by Kathryn Croft, you really should. Why not start with this one? I highly recommend! Convinced she didn’t kill Lee, Tara flees home and stays silent, holding her breath as the investigation grips the neighbourhood. 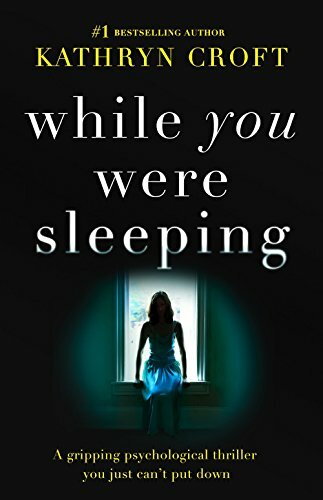 But as her daughter spirals out of control, and her husband becomes increasingly distant, Tara starts to wonder if someone in her own life knows what really happened that night. And when the police turn their questions towards her, Tara realises she has to find out. Kathryn worked in HR and management training before her passion for literature led her to train as an English teacher. She spent six years teaching secondary school English; a job she believes was invaluable to her writing career. Kathryn now devotes all her time to writing. Make sure you catch up with, and follow, the rest of the blog tour with these awesome book bloggers….. Sounds good! I need to add this to my TBR. I think Bookouture is amazing in the authors they have found and promoted.